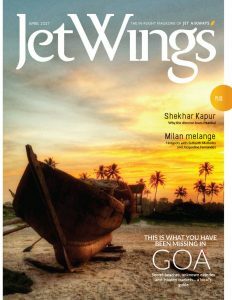 Jetwings is an In-flight magazine of Jet Airways. It is a widely known fact that Jet Airways, India’s leading complete full service airline, is flown and frequented by the crème-de-la-crème of the Indian society who wants nothing but the best. The words that best describe the in-flight magazine of Jet Airways i.e. JETWINGS are “Informative,” “Useful” and “High Quality”. Fliers make a habit out of reading JETWINGS as they get involved with the content of the magazine and like reading feature articles, travel & lifestyle sections and flight maps & schedules. Jetwings & Jetwings International (with a combined print run of 5 lac copies) enjoy a combined readership of over 3 million crème de la crème readers. Exopic Media offers advertising solutions in Jetwings (Inflight Magazine of Jet Airways). For more details and advertisement related query, please write to us at info@exopicmedia.com, Or you may also call us at +91-7678237402.